The bar graph that runs along the bottom represents all of the chapters in the Bible. Books alternate in color between white and light gray. The length of each bar denotes the number of verses in the chapter. 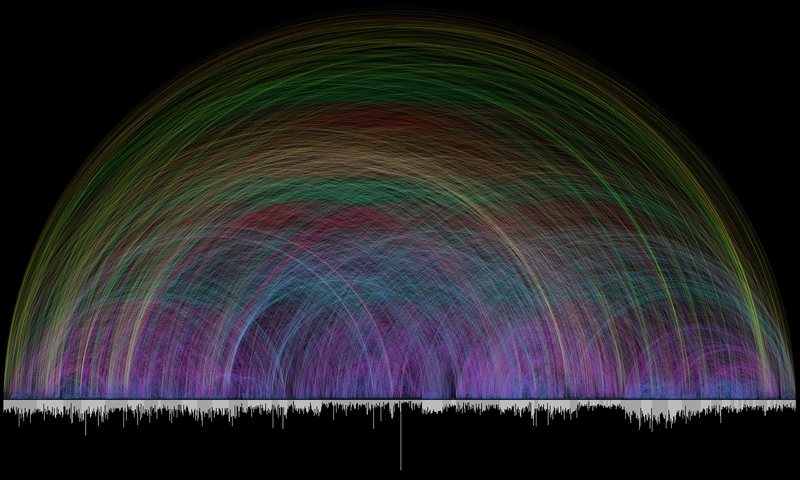 Each of the 63,779 cross references found in the Bible is depicted by a single arc – the color corresponds to the distance between the two chapters, creating a rainbow-like effect. This is truly an amazing display of the truth that “men spoke from God as they were carried along by the Holy Spirit.” (2 Peter 1:22) For how else could 66 books, written by over 40 men, over a period of 1500 years be so unified and interconnected if it was not the true Word of God? The beauty of this rainbow image and what it communicates should serve to warn those who believe they can take sections from the Bible, or add to it. For how can you take or add from something which relies on itself so much? How can you use a verse of the Bible to support your argument, when you don’t also consider the hundreds of other verses connected to it? The Bible is one – it cannot be broken up. We must survey the entire Bible to determine what it is saying on an issue before rashly using one verse to prove a point or condemn something. This hymn (“How Firm A Foundation”) reminds us of the truth that the Bible is strong and complete. “What more can He say than to you He hath said”?